What causes interglacials? Part 1. The natural climate of Earth today is really an Ice Age with temperatures 2-4 degrees colder than today. For the last 1 million years glacial periods lasting about 80,000 years dominate interspersed with regular warmer interglacial periods lasting 10-20,000 years. The rapid expansion of human civilization has all occured during the most recent warm period which has already lasted about 10,000 years. In the previous post it was shown that each interglacial coincides with a maximum of the orbital eccentricity. Furthermore regular smaller temperature rises also occur with larger obiquity. The last interglacial occured with a coincidence of both effects which may have caused the rapid rise in temperature from the last glacial maximum. The strange thing about both these observations is that each effect acts to accentuate differences of insolation with season. Currently the Earth’s ellipticity is 0.0167 and summer in the Southern Hemisphere coincides with the closest distance to the sun. This also means that winters in the Northern hemisphere are less severe now than they were at the last glacial maximum when 13,000 years ago due to the precession of the equinoxes. 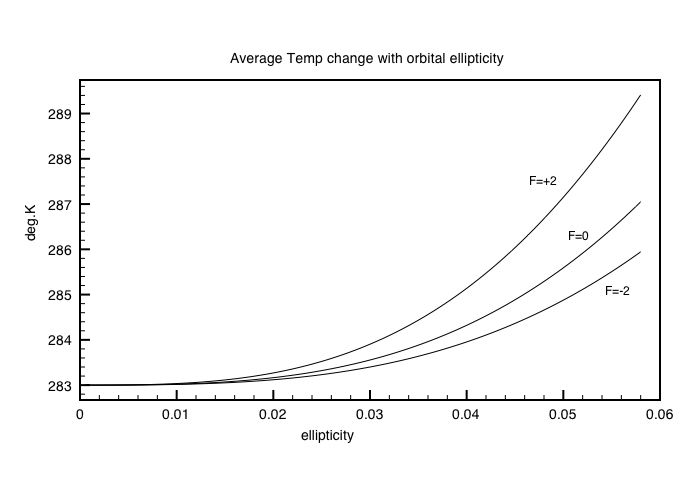 We can calculate the change in average insolation during the year with ellipticity assuming an average value of 342 watts/m2 for a circular orbit. The result is shown in the next figure. Conservation of angular momentum ensures that the average solar radiation remains 342 watts/m2, but this also shortens slightly the seasons can be seen in the variation of cross-over for different ellipticities. 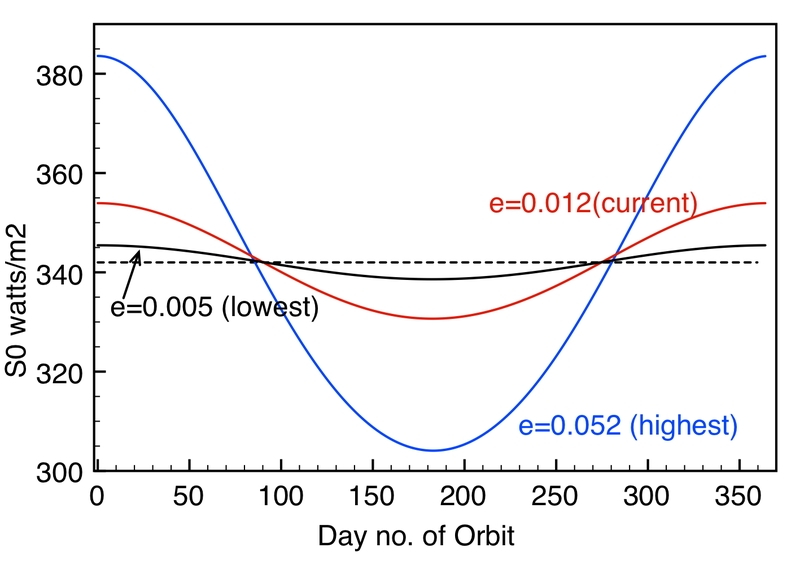 The value 0.058 is the largest ellipticity the earth reaches during a 400,000 year cycle. The current value is shown in red and shows that the southern hemisphere summers receive up to 25 watts/m2 more radiation than Northern summers and the inverse for winters. What does the actual data show ? 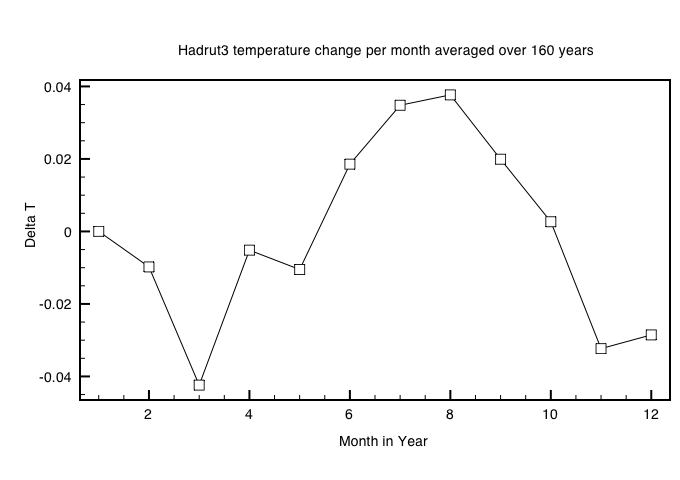 We can see this by taking the Hadley Cru global average temperature data since 1850. Instead of looking at global warming we just look at the comparison between the monthly temperature anomaly versus the yearly average temperature anomaly. Then look at he average divergence over the 160 year period. We get the following curve. ds = 4*sigma*T^3 dt so a temperature change dt will be induced by a change in radiation ds at temperature T of ds/(4*sigma*T^3). 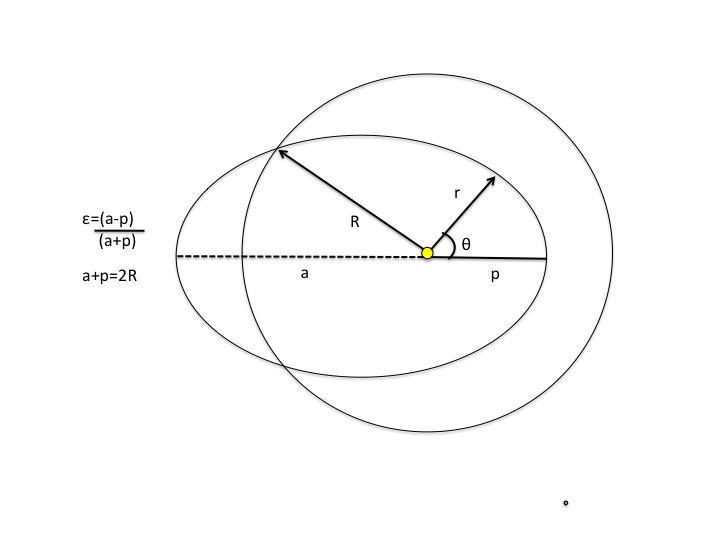 This can be calculated relative to say a fixed T=283K for a circular radius averaged over the year. This results in a small warming effect for large eccentricities shown below. 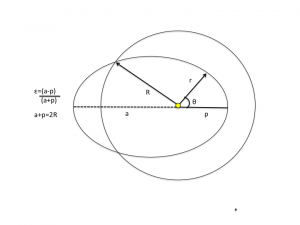 When the Earth’s orbit is near circular then summer and winter are symmetric between hemispheres. The Earth’s natural temperature would appear to be some 2-5 degrees cooler than today and in this state glaciers build up in Northern latitudes. As the orbital parameters change then increases in solar radiation for northern summers begins to melt the ice and lower albedo. This then seems to cause a run away effect which takes the earth to a new state of warmer interglacial period. The last ice age came to an abrupt end when both the ellipticiy and obliquity were at a maximum AND northern summers coincided with maximum insolation. After a warm period so the cycle repeats as the orbit becomes more circular again and the tilt of the Earth lessens and ice begins to build up again. A fit to 800,000 years of glaciation cycles based on changes in ellipticity and obliquity was described in the last post. The overall agreement is remarkably good and shows that naturally the Earth will begin cooling to a new Ice age within 2000 years. Another Ice age would be dissasterous for mankind and it is difficult to see how the Earth could support the current population. Anthropogenic Global Warming (AGW) resulting from enhanced greenhouse gasses will likely cause between 1 and 3 degrees of warming within the next 100 years after which the temperature should level off. All this depends on climate sensitivity (feedbacks from water). When seen in the context of a million years of glacial cycles such warming could turn out to have one beneficial effect, in the sense that it could delay the inevitable astronomic cycle leading to the next Ice Age. However, it is naive to imagine that Man can overide an inevitable astronomic origin for glacial cycles. This entry was posted in Climate Change, Physics and tagged Ice Ages. Bookmark the permalink. 5 Responses to What causes interglacials? Part 1. Nuke, if you have a factual rebuttal someone might even listen. Why don’t you provide something informative from one of the peer-reviewed papers you must have in mind instead of being horribly droll. Are you taking bets ? I am rather late to this discussion but I have a guess as to what ‘nuclear-is_good’ is exercised about. Published literature ( I am probably behind the times but Droxler, A. et. al. 2003. Geophysical Monographs 137. AGU may be a good place to start). The general argument there is that the current interglacial is most like MIS 11 from about 430K when the ellipticity was very low, as it is now. That interglacial is thought to have lasted as long as 50K, the Milankovitch cycle ‘missing a beat’ as Colin Summerhayes has put it. Thus Droxler et al think we have another 30K before the next glacial period. That’s correct the current interglacial is most similar to that 430K years ago. There is a ~400k super-cycle in eccentricity. I also believe that the preceding glacial cycle was the coldest yet with a classic saw-tooth shape like the last cycle. Small eccentricity suppresses the precession effect on polar summers. My own suspicion is that the next dip in solar insolation due in around 15k years will tip us into the next glacial cycle unless CO2 warming can delay it. Every cloud has a silver lining! Ralf Ellis has also proposed a solution as to how ice ages end even when eccentricity is small.